Last summer, we were visiting a Rolex boutique in Orlando (who also had a lot of pre-owned watches for sale) and tried the Datejust II for the first time. Although the stainless steel / gold Datejust watch is still King since it appeared in the Wallstreet [and American Psycho] movie, the relatively new Datejust II is definitely a great option for those who are looking for a watch that will fit just every occasion. The diameter of 41mm is pretty easy to get used to and the big fat luminous hour markers and the large crown at 12 o’clock make perfect use of the large dial. The white gold bezel is impressive, especially in sunlight. The blue dial on the model we’ve had for a while really stands out when exposed to sun rays. The dark blue dial some times turns into a deep purple color, simply amazing. 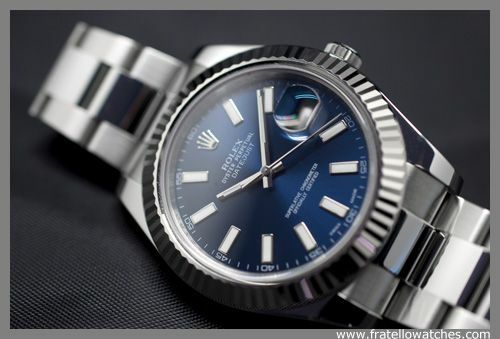 The Datejust has been there since 1946 and has probably been the most popular Rolex watch world wide ever since. Rolex does not disclose these numbers unfortunately. Perhaps a Datejust is just not exciting enough for watch collectors, but we are pretty sure that this could be a perfect ‘only watch’. Be it a graduation gift, wedding gift or just for those who only buy one good watch in their entire life. 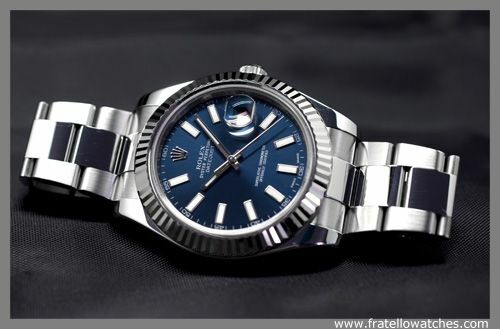 You can’t go wrong with this stainless steel Rolex Datejust ref.116334. This Datejust II features most of the recent innovations Rolex introduced in the last few years. The flimsy folding clasp has been replaced with something more solid with a great adjustment system and the movement has been upgraded to caliber 3136 featuring the patented Parachrom hairspring. For now, the stainless steel version of the Datejust II is only available with a white gold fluted bezel. 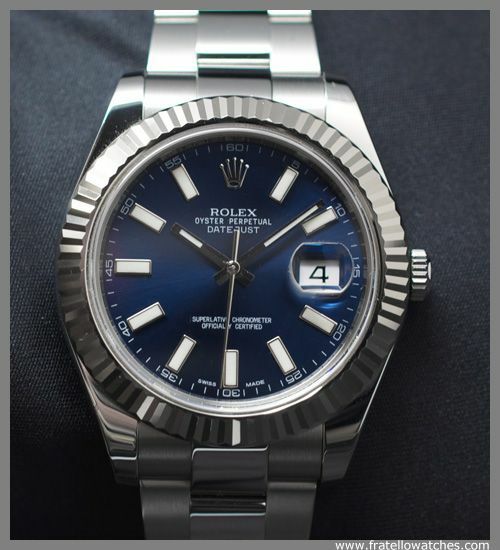 We suspect that BaselWorld 2012 might bring the Datejust II version with a smooth bezel. Actual list price is 6.780 EUR. However, on the pre-owned market, you should be able to find one around 5000 EUR / 6500 USD.